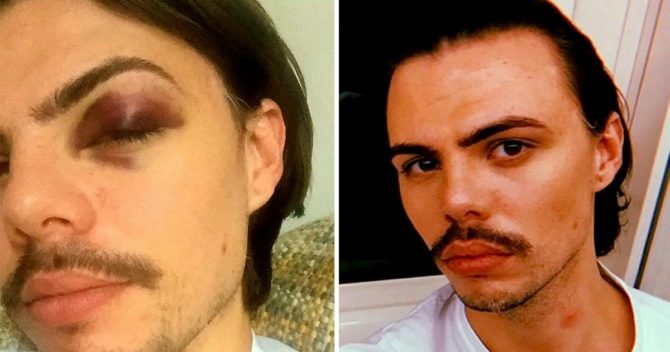 YouTube personality Tom Payne and his roommate Luke Marsh met Sean, an Australian traveler, at noted London nightclub G-A-Y. The three decided to leave the club together and stop off at a Hardies chicken restaurant on their way back to Tom & Luke’s flat. There, they encountered a pair of hostile men. “It was just the three of us,” Payne (above) told reporters. “You can tell I’m a gay man, and with the three of us it was obvious we weren’t heterosexual alpha males and that made me feel like a target. We ordered food and suddenly we started getting these comment and pretty sure one of them was fa*got.” Payne believes the men were triggered when Sean gave him a kiss on the cheek. The three decided to leave to avoid any trouble. Outside the shop, the two men attacked Sean from behind, punching him in the face knocking him unconscious. Payne and Marsh tried to intervene and got attacked themselves. Police and an ambulance arrived shortly thereafter, taking Sean to the hospital. Doctors treated him for his injuries and discharged him. Scotland Yard is investigating the crime, but thus far, has made no arrests. The owner of the Hardies stated that though the restaurant has security cameras, they were malfunctioning the night of the incident. Of course they were malfunctioning that night. Of all nights. Guess Hardies’ owners or managers are bigots too. Yeah, I’ll bet if any hardies property was stolen you can bet they’d be operational. Duh, Hardies is owned by CKE Restaurants, founded by Carl (KK)Karcher, a right wing but-job and avowed homophobe. DON’T EAT THERE! Yes, I can vouch for the truth of the homophobia of Carl Karcher, founder of the fast food empire. He lived in Orange County, CA., and was a HUGE conservative, wealthy GOP supporter. I still don’t eat at a Carl’s franchise, even tho Carl is now long dead, and GOOD RIDDANCE. There are Hardee’s in London but their is also a single Hardies Fried & Peri Peri Chicken take away place near G-A-Y. Oh wow. Here in Cali we have Carls Jr. One right down the street from me. Been years since I’ve been to it. Didn’t know that about him but for me wouldn’t go there because the food is crap. Not sure if you can call that a boycott.